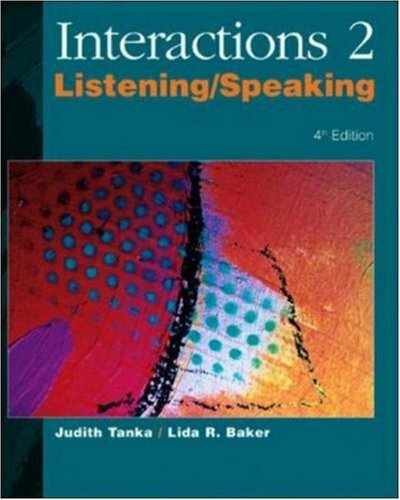 "Interactions Mosaic 4th Edition" is the newly expanded five-level, four-skill comprehensive ESL/ELT series for academic students. The new edition, for beginners to advanced learners, incorporates interactive and communicative activities while still focusing on skill building to prepare students for academic content. Reading, writing, listening and speaking, as well as grammar are thoroughly presented in each strand. High-interest themes are integrated across all skill strands and levels. Language proficiencies as well are articulated from level to level. New features include: global activities are suitable for ESL/ELT monolingual or multilingual classrooms; new design, content, audio programs, photos, and illustrations reinforce skill-building exercises; placement tests and chapter quizzes are included in each Instructor's Manual; user-friendly instructions, complete scope and sequence, and consistent chapter structure offer greater flexibility in lesson planning; new videos, one per level, immerse students in authentic language. Please upload it again. Links are dead. Last edited by deutsch3000; 10-04-2012 at 10:26 PM. please upload audio cd 5. it is missing now.